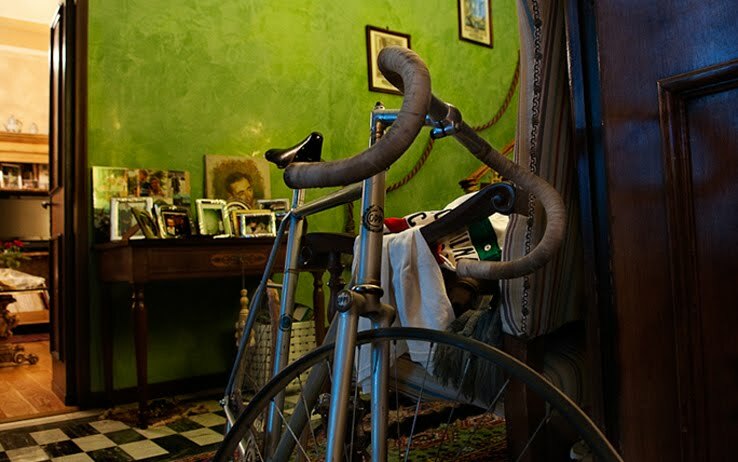 One of Fausto Coppi's track bikes is in the Coppi family home where his son Faustino (above) and family live now. This track bike was used between 1949 and 1950. Note the fork design. "The fork detail is Fiorelli. I'm not sure if that would date the bike a little later or not?" 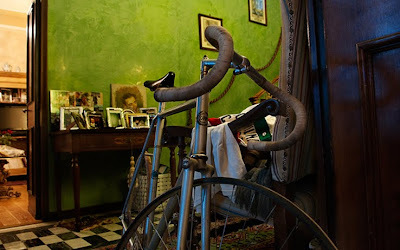 "Here are two images of a real Coppi pista bike-the "Pokerissimo" owned by Giuseppe Drali. Drali has another Coppi Strada bike as well as several other important Bianchis. Hs father worked for Bianchi and bought the bikes from them." The photos of Campagnolo's electronic shifting gruppo on the Pinarello at the Giro d' Italia presentation caused, of course, quite a stir. Subsequently, came news that the gruppo would debut on the Pinarello bikes of the Movistar team next year. "In relation to the recent appearance of the new electronic transmission mounted on the Pinarello bicycle that Campagnolo made for the for the 2011 Giro d'Italia we emphasize that it is still considered a prototype even if very close to the version that will be used by professional cyclists next season by the team of Pinarello/Movistar. As in the traditional Campagnolo strategy it is our belief that the products that will go to market must first be tested and "put to the whip" by professional cyclists. The company's extensive experience in innovation tells us that this approach is undoubtedly the best avenue for the end product to have the most performance and reliability. We also take this opportunity to inform everyone that the same Pinarello/Giro d'Italia bicycle will be on display at the upcoming Cycle Mode salon in Tokyo, while the official announcement on the "programma sportivo" for the the group will be announced by Campagnolo during the presentation of team Pinarello/Movistar. In accordance with the normal timing related to the launch of a new product, the technical details, photographs, and all information relating to the final product will be announced at a future and formal presentation." A few close-ups of the components here. 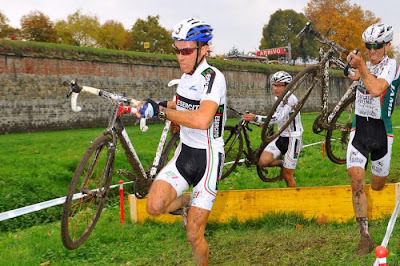 The Italian national cyclocross championship season, the "Giro d'Italia Cross", for 2010-2011 is set to get underway this Sunday in Grumento Nova (PZ). 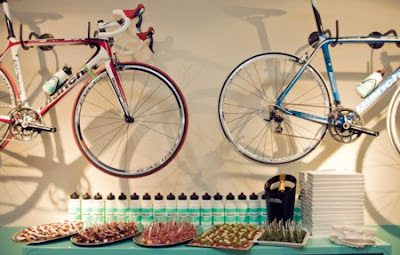 As part of the Swedish holding Cycleurope, Bianchi held the press launch of its first Cafè&Cycles concept store in Stockholm, Sweden, on Tuesday October 26th, in its 125th anniversary year. The event started early in the morning and brought into the new Bianchi’s store around hundred authoritative journalists and many local VIPs’ in addition to Bianchi top managers to celebrate a dream that came reality: the dream of Salvatore Grimaldi, owner and chief group manager of Cycleurope AB and Bianchi. 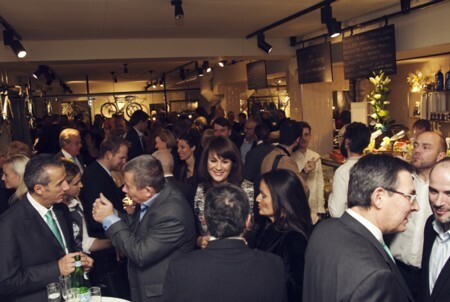 Placed into the core of Stockholm, in the very fashion and shopping area of Norrlandsgatan, Bianchi’s Cafè&Cycles unveiled to the press the first concept store in the world combining the strength of the Bianchi brand with a wide selection of Italian typical food and wine. 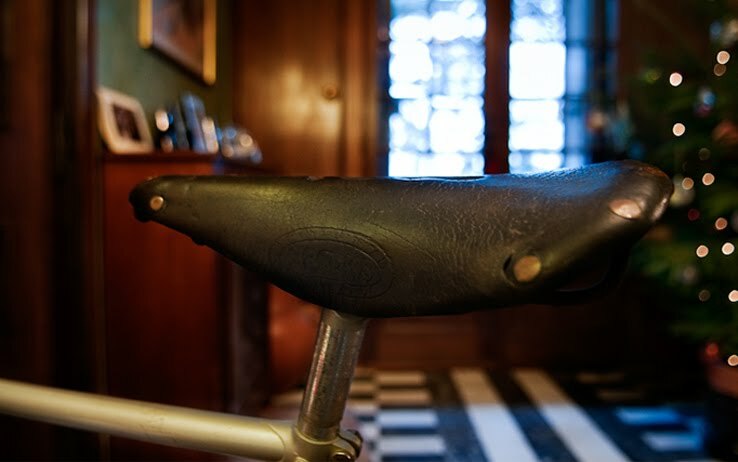 The idea was to create a special place where avid bike enthusiasts and bar guests interested in interior design can meet, share experiences and talk while enjoying the best of Italy. The Café has 94 seats indoors and 30 seats on the patio. Available at the Cafè&Cycles are some of the most significant Bianchi bikes, such as the new Oltre road model (with the Black - Limited Edition version), the Sempre one, but also the cool Urban Fixed Gear bikes, the Camaleonte models as well as the MTB Methanol SL and a wide range of City Bikes. “By opening the Bianchi Café&Cycles, a new chapter in Bianchi’s history has been written”, said Mr Grimaldi, who confirmed he took inspiration for this new project from his wife Ewa. “We have combined our brand and our celeste colour with the beautiful Italia: it is a perfect mix of passion, style and design. The made-in-Italy is well known all over the world – Grimaldi continued - and our mission is to increase the global awareness of our products through this kind of initiatives”. Bianchi’s ambition is to identify additional markets for the Bianchi Café&Cycles concept store: “Of course we have to understand the reaction from public but our aim is to open other stores in different countries starting from Milan, then Tokyo, New York and London. It is an ambitious project but I’m ready to go for that”, Bianchi’s owner added. Bianchi CEO Bob Ippolito attended the press launch in Stockholm: “Cycling is lifestyle but food is lifestyle too. That’s why it’s a winning mix to combine our high quality bikes with a special Italian menu to offer customers a fantastic experience into a warm and inspiring atmosphere, surrounded by the photos of those who wrote the most important pages of Bianchi’s history”. The first Bianchi Café&Cycles, managed by Sweden’s Nicklas Sigurdsson, will be officially open to the public on Saturday October 30th. The first granfondo date for 2011 is the GranFondo Maratona del Deserto in ! Sharm El Sheikh !, Egypt. One week of cycling along the inspiring landscape of the Red Sea will conclude with the granfondo on Janaury 28th. The event is being organized by the WORLD BIKE A.S.D. club. This will be the first first edition of the event. Certainly a unique opportunity for a winter vacation and to prepare for the new cycling season. 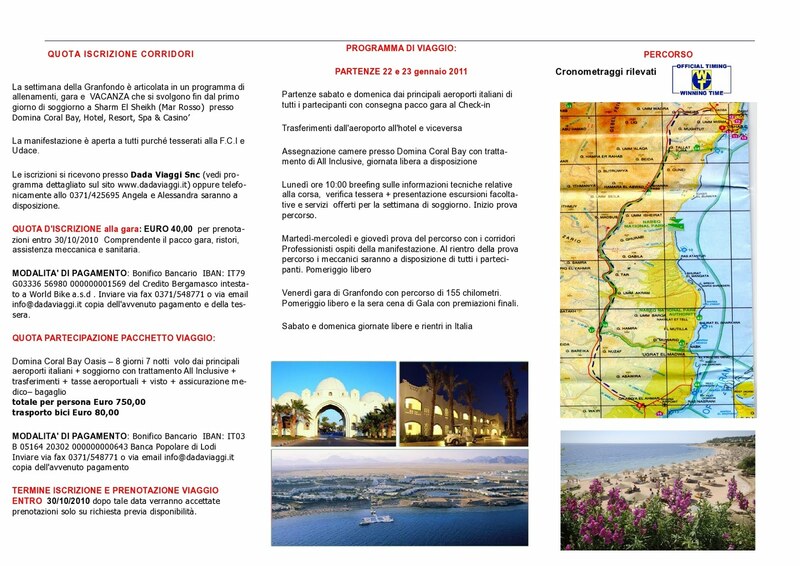 Participants will stay at the Domina Coral Bay Hotel, Resort, Spa & Casino - Red Sea, located in Sharm El Sheikh. Departure flights from Italy are Saturday, January 22, and Sunday, January 23. 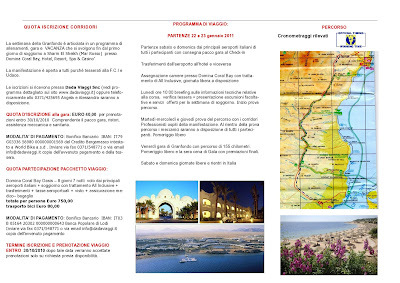 Vacation packages of flight + accommodations for 8 days/7 nights are available from the organizers. There will be daily cycling workouts and plenty of time for swimming, snorkeling and scuba diving. The granfondo will be 155 km in length. The Sharm El Sheikh area is very popular with Italians, and other Europeans, owing to its dramatic landscape, year-round dry and temperate climate and long stretches of natural beaches. Its waters are clear and calm for most of the year and have become popular for various watersports, particularly recreational scuba diving and snorkeling which some consider to be among the best in the world. Details, in Italian, of the week long event can be found here. The details state that you must have a FCI or UDACE license. I have no relationship of any kind with the organizers, or the event. A friend of Marco Pantani has decided to auction for charity the Bianchi that Marco Pantani won the Grenoble-Les Deux Alpes stage of July 27, 1998. 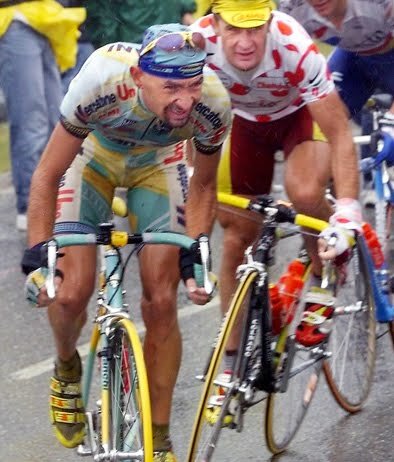 That victory earned Pantani his first yellow jersey. 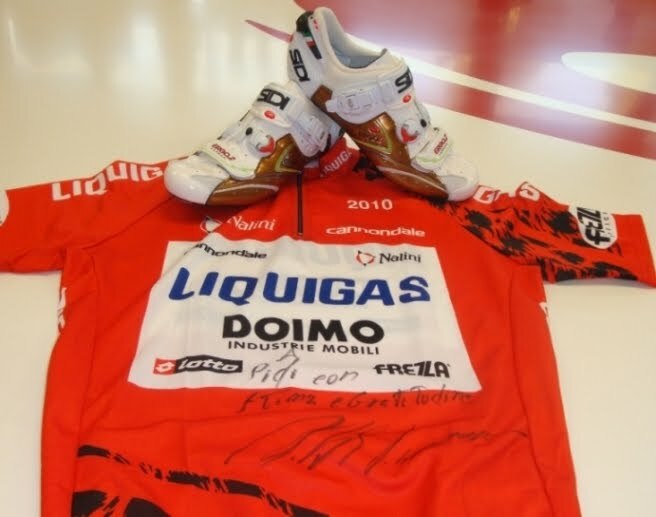 Much of the proceeds from the auction (the base price will be set at 250,000 euro) will go to charity. The auction will take place on January 13, 2011, the date of Pantan's birthday. The owner of the bike, Franco Corsini, explained, "I was in Forli with him and other friends. Before returning home he took me aside and told me point-blank: 'Go and see in the trunk of my car, there's something for you'. I could not even take it out of the trunk so great was my excitement. On that day, Marco told me that with that Bianchi he had won the mythical stage of Les Deux Alpes Tour of '98, the '99 Vuelta Murcia and used it during the '99 Milan-San Remo." A few months ago Corsini requested and was granted a certificate of authenticity from Bianchi. Corsini will still have one other of Pantani's bikes. "It's the Wilier Triestina of another memorable victory, that of July 17, 1997 Alpe d'Huez," he said. As for myself I have one piece of Pantani memorablia. It's a photo card of him that he signed one week before his tragic death. Update November 4, 2010: the Pantani family has categorically denied that it may be the bicycle that has been raced on the famous Tour stage from Grenoble to Les Deux Alpes, now legendary, let alone the Milan-Sanremo the following year. 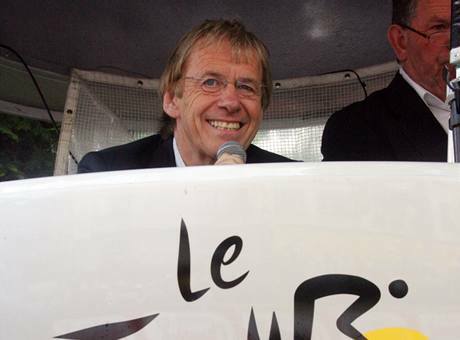 The famous finish line commentator's voice heard at the Tour de France belongs to Daniel Mangeas. His broadcasting for the Tour began in 1974. He is a talking cycling encyclopedia, never using notes, working entirely through improvisation. The finish line voice for the Giro d'Italia is Barbara Pedrotti. With sheer determination, toughness, and intelligence she recenty became the first female voice of the Giro. As a young girl she dreamed of becoming Miss Italy. Then, she fell in love with the world of cycling. Pedrotti explains, "I love cycling. Seeing the old families along the roadsides awaiting the arrival of their champions. Grandparents, mothers, fathers, sons and grandchildren, as a celebration of the country, with panini and salami ... it's beautiful, is it not?". Vincenzo Nibali, "the shark from the strait", recently visited the SIDI headquarters in Maser (Treviso). Winner of the 2010 Vuelta a Espana, Nibali brought Dino Signori a really special gift, the red jersey from the Vuelta with one of his two Ergo 2 Carbon Lite shoes, autographed with a dedication to Sidi. "Shoes are essential because they are a means by which the athlete is joined with his bike", explained Nibali. "It's the transmitter that expresses the force and power of the muscles to the road. I have a special relationship with my Sidi. Usually, over the course of a season, I don't use more than four pairs of shoes. It's become a tradition that about three weeks before a big stage race or goal I'm preparing for, I get a new pair of Sidi, put on the new clips and begin preparing to take on the adventure. It's almost become a good luck ritual. All the Sidi models are extremely resistant and last a long time, but in a major three week race, your shoes, like your bike and all your equipment, undergo a great deal of stress: falls, rain, dust and mud. For example, after the Giro I continued using the same Ergo 2 Carbon Lit for about three weeks before changing them. It means a lot to me to line up at the start of each new major event with my shoes in perfect shape, neat, clean and in order; that's just how I am." 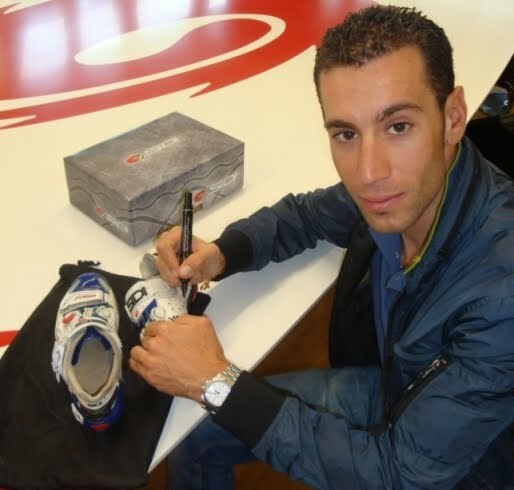 As a gift Nibali was presented him with a pair of Ergo 2 Carbon Lite in the new “bronze” version. On Tuesday Nibali checked into the hospital in Lucca for the removal of a plate and screws that had been inserted after he sustained a fracture of his left collarbone at the Elenco Tour in 2009. The operation lasted two hours and was successful. I mentioned "Campy Tech Lab™ " for the first time in the previous story about Campagnolo's electronic shifting system that was on display at the Giro d'Italia presentation. Campagnolo's Campy Tech Lab™ is, "the pride and joy of our company, the beating heart that delivers the innovations and the innumerable patents that over the years have contributed to creating and preserving the Campagnolo legend. The Campy Tech Lab™ is imbued with a culture of thinking projected into the future, constant analysis of what can be improved but above all what we really want to innovate." Recently, Campagnolo decided to open the doors of the Campy Tech Lab to enthusiasts by creating a special section on their website. 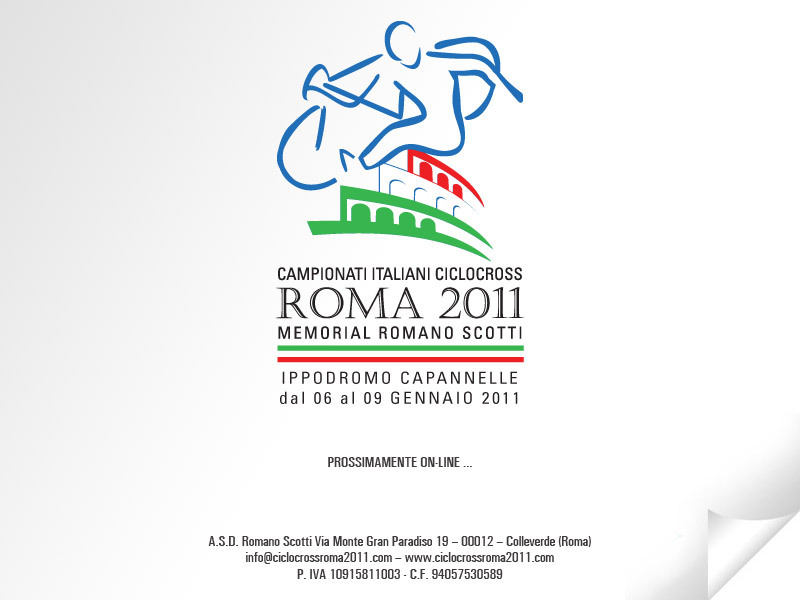 There Campagnolo illustrates the very technologies that are formulated every day and designed inside the company. Campagnolo believes that giving consumers access to its technological ‘heart’ will contribute to an understanding of the work that takes place in Vicenza. recent innovations. However, nothing yet has been posted regarding the electronic shifting system. As can be seen the parts are labeled "Campy Tech Lab™". The Campy Tech Lab™ as defined by Campagnolo is, "the pride and joy of our company, the beating heart that delivers the innovations and the innumerable patents that over the years have contributed to creating and preserving the Campagnolo legend.The Campy Tech Lab™ is imbued with a culture of thinking projected into the future, constant analysis of what can be improved but above all what we really want to innovate." The Campy Tech Lab™ that appears on the components is certainly not going to be the final branding. Nor do we know how close this version is to the one that that will be raced next year or available to the general public. Campagnolo has announced that the Spanish Movistar team will be the first and only professional squad to use the Italian company's new electronic gear system in 2011 before it goes on general sale. Video of the final, unpaved, kilometers of the Colle delle Finestre during the 2005 Giro d'Italia. This was the first year the road was used in the Giro. The video is a re-broadcast by SPORZA so it is not in English but definitely worth watching for the action and scenery. 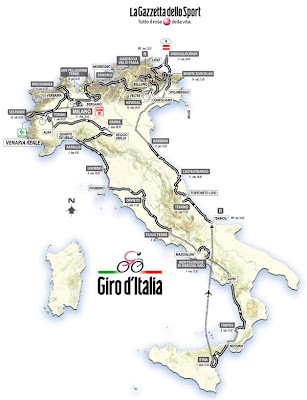 "At CycleItalia, we’ve always been inspired by Giro d’Italia routes as we search for interesting itineraries to delight and challenge our clients. We’d heard Colle delle Finestre stories for years, but until it was included in the Giro route in ’05 we’d looked elsewhere, largely because those stories involved unpaved portions of the climb and descent near the top. In ‘05 we saw the climb enter the “epic” category via dramatic TV images with Danilo DiLuca first to the top. We knew then we had to offer our clients the chance to experience this instantly legendary climb, especially after we saw that the descent is now PAVED! Late in the summer of 2006 we loaded up our van and drove to the town of Susa with two goals. We wanted to judge the condition of the road to ensure our van could make it over the top. If not, sending our clients up would be impossible, as close-by support is of paramount importance to us. And we wanted to find out how rideable the surface would be on a bicycle. We knew the road had been freshly rolled smooth for La Corsa Rosa 2005, but we wouldn’t arrive with guests until July of 2007. As we started the climb from Susa we made our first discovery – just how steep, narrow and twisty the paved section is! More than one switchback corner forced us to back the van up to make it around. We negotiated most of the ascent in our van’s lowest gear. Once beyond the pavement a different adventure began: It was hard to getting the van going again if we stopped for any reason. Soon it was time to get out a bike and test the surface for cycling. We used our usual road bikes shod with Vittoria Corsa open tubular tires, our favorites. Riding the loose and rock-strewn surface, we realized that with a bit of care, climbing was not much more difficult on this surface than on pavement, even though the grade continued at more-or-less the same steepness. We completed the climb with both van and bike along. We felt we had a great experience to offer our guests in 2007. The big day arrived. The plan was for our small cycling group to depart in advance of the van; it would wait at the end of the paved section, giving our cyclists a good head-start. We wanted to avoid the risk of driving back down the steep, unpaved section to rescue anyone with a flat tire, etc. Unlike the racers in 2005, we departed from Susa after breakfast. We were onto the climb almost instantly without the 140+ kilometer “warm-up” ride from Savigliano, including a climb to Sestriere. 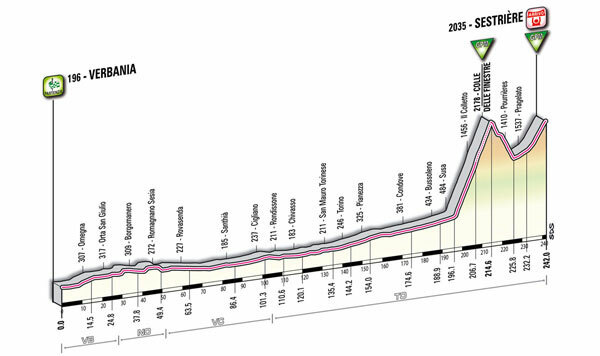 Our plan was to do this epic climb with legs as fresh as possible, then follow the Giro route to Sestriere and back to Susa, making a 95 km (58 mile) loop with 2692 meters (8641 ft) of climbing! That’s enough for one day, especially as most of us had climbed the Col de l’Iseran and Moncenisio the day before. It was already warm that July morning, making the shade on the paved section through the forest welcome. The grade averaged over 9% with steeper pitches of 12%. All of us rode in our lowest gear (most in 30 X 26 or 34 X 29) from the start. As I climbed my mind filled with doubts (even though I’d been here before, we’d only driven this paved portion) and thoughts of “if it’s THIS tough on the paved part, what can we expect once we hit the dirt?” At that point you can’t see much above through the foliage. You have only the TV images to recall the challenge, or a vague memory as in my case. Your cyclometer and the CycleItalia RideGuide tell you the pavement ends eleven kms after you left Susa with eight more kms to climb on the “strada sterrata.” The last few switchbacks on the pavement open up to a panoramic view of the Susa valley but all you can think of at that point is “how much harder can this climb get?” A pause at pavement’s end for a drink of cool spring water and some encouragement (and maybe some sugar cookies?) from the CycleItalia van gives you a chance to gather your thoughts and remaining strength for the rest of your challenge. The straight stretch of “road” as you enter the unpaved section is remarkably smooth and easy to pedal, letting you shift up a cog or two from your lowest gear. The switchbacks start soon enough and the average grade of over 9% returns, meaning you shift back to that (thankfully) lowest gear. You must pick your line carefully as the surface is strewn with sharp rocks with some ruts thrown in. You realize that rounding the curves on the outer edge is even more important than on pavement, as you can avoid many of these obstacles. At this point you begin to imagine RACING up this climb with screaming Giro “tifosi” on both sides of the road, many who’ve hiked up or camped out here for days waiting for you to ride past. You’ll probably not be riding no-hands as Danilo DiLuca did while unwrapping a panino , but instead you’ll choose your line carefully. You’ll occasionally glance upwards to check your progress on the climb. As you pass farmhouses you’ll wonder how challenging it is to drive a tiny 4 X 4 Fiat Panda up and down this “road” to haul provisions in (or to haul the cheese you make out) of this remote location during summer. You might recall black and white images of Coppi or Bartali, riding a bike with just a few gears, not the 20+ of your modern machine. In those days most if not all of the roads were gravel or dirt. With spare tires hung over their shoulders and goggles shielding their eyes, how much more difficult were these feats for them back when…? The natural amphitheater starts to open and you can see the summit. You imagine the throngs of fans who were here in 2005. At the top, there’s a stone sculpture recounting the events of that day along with a small monument garden paying respect to the nine “most epic climbs in cycling” the Izoard, Fauniera, Mortirolo, Gavia, Stelvio, Ventoux, Tourmalet, Alpe d’Huez and Galibier. After recalling each of the listed climbs we’d completed over the years, we shared in the collective delight at having survived another epic one. We posed for celebratory, commemorative photos. Thankfully, the descent is now paved. 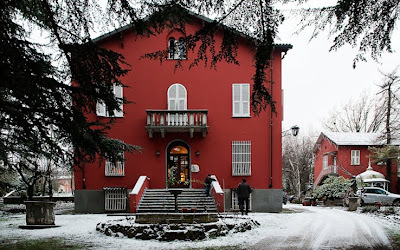 We’re able to make a quick ride down with a slight unpaved detour to a remote agriturismo where meals are served in bright mountain sunshine. 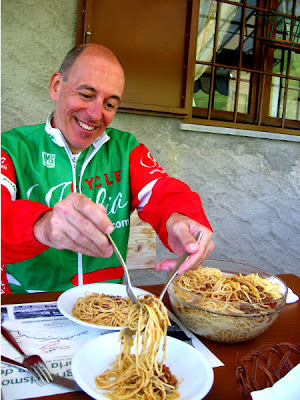 Unlike the racers WE get to enjoy a sit-down pranzo, refueling with spaghetti ragu and mixed salads after our efforts. After all, we have to make sure we take in enough calories to ride to our gelato stop in Sestriere!" 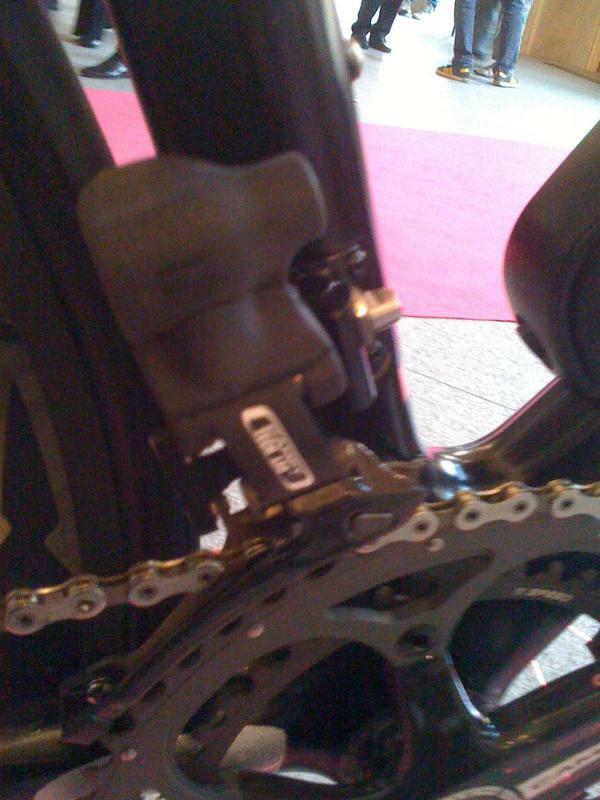 Indeed, the Pinarello bike we wrote about earlier today is equipped with a Campagnolo electronic shifting system. Campagnolo has announced that the Spanish Movistar team will be the first and only professional squad to use the Italian company's new electronic gear system in 2011. 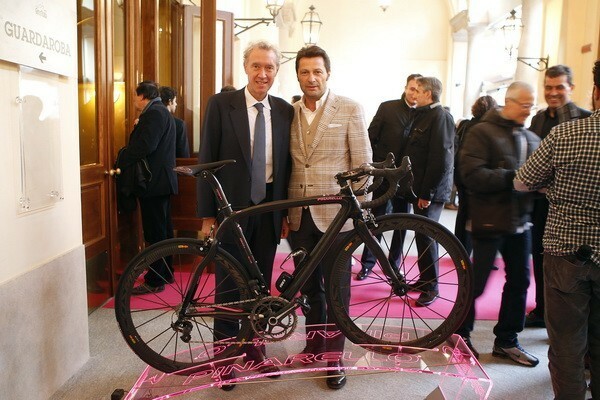 The much awaited electronic groupset was unveiled on a special black and pink Pinarello bike on show at the presentation of the 2011 Giro d'Italia. Pinarello has replaced Cervelo as the official Giro d'Italia bike for the next three years. Shimano released its Di2 electronic system two year ago but Campagnolo delayed their own electronic system as they continued to work on the project. "Shimano were the first to produce an electronic system but we kept working hard on our system and now the bike unveiled is very similar to the bike that will be used by the new Movistar team," Valentino Campagnolo told Cyclingnews. "Our system is different to Shimano's. Their one is ten-speed, while ours is 11-speed. It will also have other different aspects too but it's a little bit soon to talk about it now." Stories for the Italian Cycling Journal about rides, granfondos, having a good time cycling in Italy, Italian cycling history, etc. are very welcome. Contact me at veronaman@gmail.com. There are more than 1,600 stories in this blog. The search feature to the right works best for finding subjects in the blog and there is also a translate button at the bottom so you can translate each page. What I'm riding. 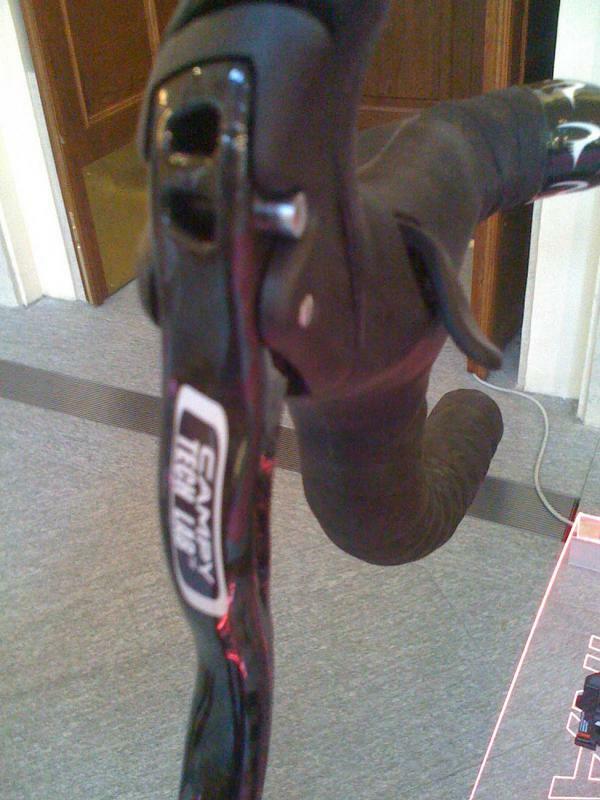 Pinarello with Campagnolo Electronic Shifting? Thanks to reader "AD" who sent this photo in of a Pinarello bicycle on display at the Giro d'Italia presentation yesterday. 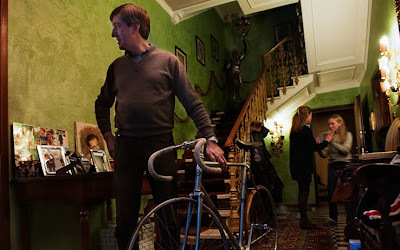 Standing by the bike are Valentino Campagnolo and Fausto Pinarello (l-r). 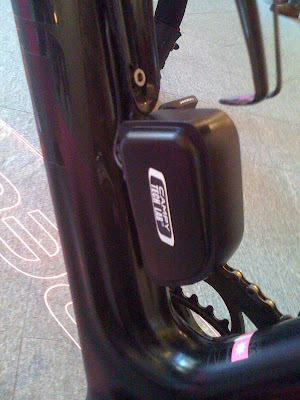 It looks to have electronic gadgetary (battery, front derailleur); click on photo to enlarge. The last word we had on Campagnolo's electronic shifting system was that they had decided to focus on 11 speed development rather than 10 speed electronic. 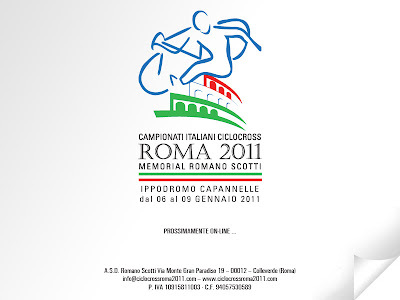 Perhaps Campagnolo has an electronic gruppo close to production now? There were rumors that Campagnolo was going to announce their electronic shifting gruppo at Eurobike in September but that didn't occur. We had several stories regarding Campagnolo electronic shifting including these: Electronic Shifting (February, 2009) which cited Campagnolo as having delayed bringing its version to market because of the economic downturn. Electronic Shifting, Part II (June, 2009) which discussed the progress that Shimano was making on the development of Di2. Stefano Garzelli: "If I have to assign a rating it can only be a 9, there are quite a bit of transfers." Damiano Cunego: "A 9 for a well designed and beautiful Giro which touches almost all the regions of Italy. We are still studying exactly what races I'll do in 2011 but I think I'll do the Giro. It is a very, very tough race. But, a race of this level should be hard otherwise what Giro d'Italia would it be?" Vincenzo Nibali: "It will be a very exciting and I look forward to racing it. I'll give the route a nine out of ten. 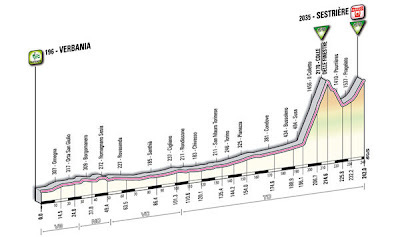 I've done the Giro three times now and this is the hardest one I've ever seen. As well as the big climbs, there are other minor climbs during stages that could split the peloton and cause problems. I only know one of the two climb up to Etna but I know the other one is very hard. 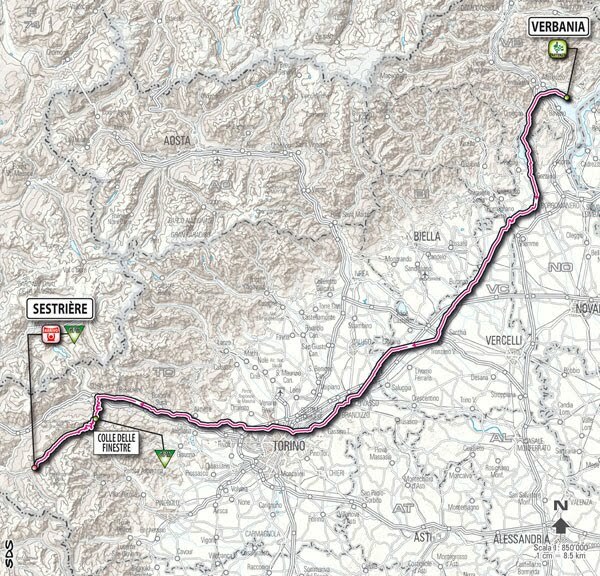 The final time trial is 32km long and so will be very important. I hope to be team leader and to try and win it." Alessandro Petacchi: "There is no use lamenting, it is what it is. There are so many mountains and I am not a climber. I will give it 8.5 out of ten. It's a good Giro and there could be seven finishes if we're lucky but there are too many transfers. There are several stages with hills in the finale but that could turn out to be an advantage for me." Alessandro Ballan: "I have never raced the Giro, and I'll work hard if I will have the opportunity to do so in 2011. It's a tough route but there is something for everybody and so it’s balanced. It should be great to watch but it'll be hard to ride. The dirt road of the Colle delle Finestre is probably too tough for me but I hope to be up there on the dirt section on the stage to Orvieto and on other hilly stages. It'll be my first ever Giro and I'm looking forward to it after doing the classics." Giovanni Visconti: "I wore the maglia rosa in 2008 and it was a very important moment in my career, so I'll give the route a ten out ten in the hope to ride it. I'm from Sicily and so the finish on Etna will be special but it'll be really hard to beat Nibali that day. I hope to go for other stages. A stage win could help my career step up to another level." Felice Gimondi: "It is a wonderful Giro. I assign two values, an 8 from the technical point of view and a 10 from the social point of view because it extolls Italy to go back to believing in herself and grow as it has shown that they can do in these 150 years of shared history." 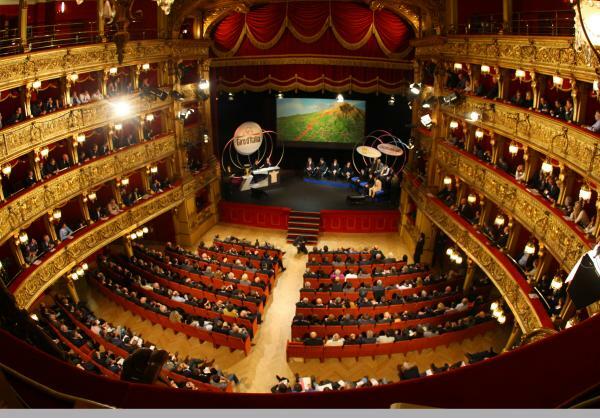 In 2011 Italy is celebrating the 150th anniversary of unification. Decima tappa: 17 maggio, Termoli-Teramo, km 156. Tredicesima tappa: 20 maggio, Spilimbergo-Grossglockner, km 159. Quattordicesima tappa: 21 maggio, Lienz-Monte Zoncolan, km 210. Quindicesima tappa: 22 maggio, Conegliano-Gardeccia-Val di Fassa, km 230. Giovanni Visconti, Stefano Garzelli, Damiano Cunego, Alessandro Ballan, Vincenzo Nibali, Alessandro Petacchi and Michele Scarponi. Click on photos to expand; presentation group photo by Bettini.